I LOVED The Good House...and can't wait for the movie! This summer, I think. Hope you enjoy it. I thought there was a movie coming out of The Good House! Thank you for the reminder! What fun pictures! Yes, I'd probably continue with this one. Thanks for stopping by! Kim - We had such a fun time at Disneyland. My daughter keeps asking us if we are "going to school" today in hopes we'll take her to Disneyland again soon. LOL I'm afraid she's sorely out of luck. Yvonne - I'm enjoying it so far. I really enjoyed this book and hope you do too. What fun to take a surprise visit to Disneyland. Paulita - I'm enjoying it so far--and oh, my gosh, did it just get even better! Your trip to Disney sounds like so much fun! Little ones bring such joy to places like that. I love the pictures of Mouse, so cute! I do like the opener and agree with the sentiment that you can tell a lot about a person by visiting their house. I would definitely keep reading. Thanks for introducing me to the book. I don't know that it would be worth waiting two and a half hours, but I did enjoy Frozen. What a beautiful post. I love your pictures, the trip, the book, and, oh yes, what I came for - the intro. Sounds good. Good luck finishing Blind Assassin. Mouse had such fun. I think she enjoyed herself this time more than she did when we went for her birthday. I read this book a couple years ago and really liked it! Enjoy! Sarah - I am glad to hear you liked it. I'm enjoying it so far. I loved The Good House --hope u do as well. Mouse looks so happy --special day for all I am sure. I think that's a great opening! And your daughter is adorable. Thanks for visiting! Kelley - I just finished the book. So good! Love seeing Mouse with the Disney characters! 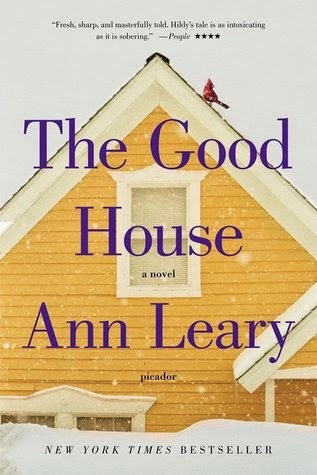 Yes, I'd continue reading The Good House--sounds intriguing. Oh my goodness what gorgeous photos, that last one must be every little girls dreams come true. I've just started The Grip Of God by Rebecca Hazell. Book one in a trilogy, I haven't read much yet but so far so good. Tracy - Thanks! I think Mouse's teacher was just as excited as Mouse about Mouse meeting the Frozen princesses. LOL She can't stop talking about it. I look forward to your review of The Grip of God! I'd keep reading. In fact I want to keep reading! May have to hunt the book down! I love the Mouse pics! Looks like you all had a great time. Katherine - I just finished the book and am really looking forward to the group discussion next week. I would continue reading, what an interesting concept! Glad you all had fun, though wow, two and a half hours! Charlie - Two and a half hours! It went by fast, but that was probably because were doing things in between. Thank goodness we could split the wait like that. My husband, admittedly, got the worst part of the wait. There were actually a lot of dads in line holding spots. You are two awesome parents to wait in that line! There's no way Jason would have been supportive of that at all! Oh my, those pics are just adorable <3 I am just starting The visitors by Rebecca Mascull but I have literally just started it, like two pages in so can't say one way or another how good it is or isn't. The last one was Last to die by Tess Gerritsen which was really good 4/5 crime, a few wee twists and the plot pulled you in so it was easy to read on the drive home. It's been ages since I last read something by Tess Gerritsen. I really enjoyed what I've read by her. Don't think I've read Last to Die yet. I'll be curious to hear what you think of The Visitors. It's one of my favourite novels - sweeping, quirky, romantic and profound. I'll be interested in hearing what you think of the novel, when you're done. Lainy - So Many Books, So Little Time - has recently reviewed my novel The Visitors and we have an interview coming up too, if you're interested. Keep up the great work on your blog! I love the pictures of your little one.